I was trying to apply this rule to our diet, mainly vegetarian with only 2 to 3 meaty night in a week. Last week, we had already enough dinner with meat, so I was thinking to cook something vegetarian on Sunday. I found this recipe online, and would love to make my own version out of it. The result is very good, and it tastes great, especially if you love cheese. First all of, get the cheese filling, the pesto sauce and the tomato sauce ready. I used a can of plum tomato, cook it with some minced garlic, and season with a touch of salt and pepper, set them aside for later use. Then, work on the pesto sauce, put basil, olive oil, garlic, pinch of salt and pine nuts in the food processors and blend them together. For the cheese filling, put chopped spinach, ricotta cheese, one egg and black pepper in a bowl and mix them together. Preheat the oven to 170C, now get a tray ready. 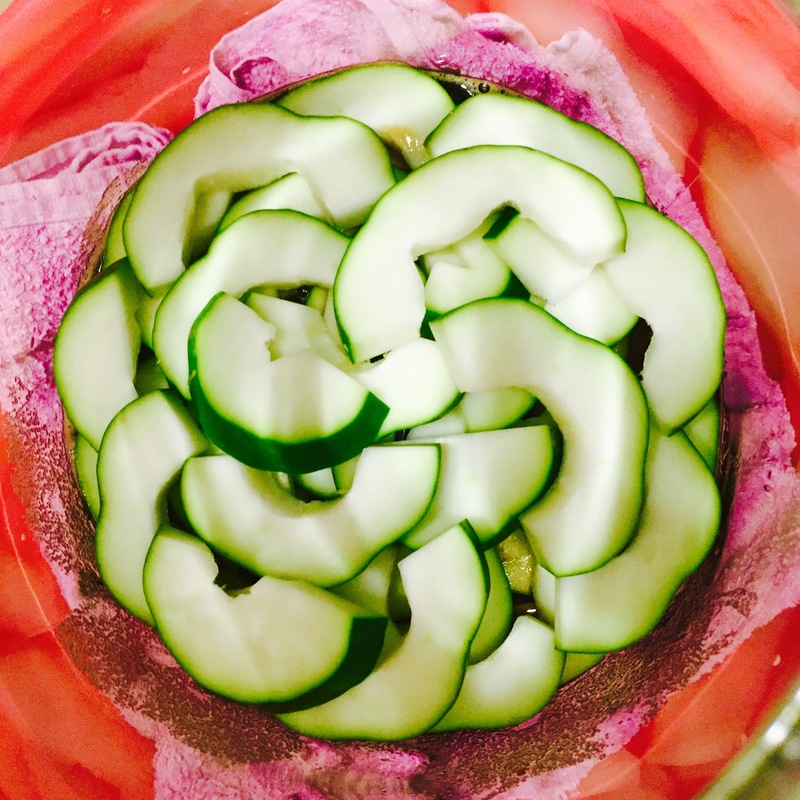 Cut the zucchini in thin slices, remember to get the big zucchini, as big as possible for easy wrapping. Place two pieces of zucchini slices in a cross, and put the cheese filling on top of the cross section, then add some pesto sauce on top, close and wrap up the zucchini. Repeat this process until you finished up with all zucchini slices. Put a layer of tomato sauce in the tray, then lay all zucchini wraps nicely in the tray. Place the tomato sauce on top of each zucchini wrap, as well as some pesto sauce as topping. Lastly, fill the entire tray with grated parmesan cheese, as much as you like. Place the tray in the oven and bake for 20 minutes. Lately, we really prefer to eat less meat, and more vegetable and plant food. After watching A Plastic Ocean, What the Health, Cowspiracy, who else has the appetite for meat or even seafood? The world is really sick, everything seem polluted and everywhere is having problems. I am not saying that I am turning to a vegetarian now, but I think eating less meat is a good act. Let’s go for a very healthy Sunday dinner with a potatoes salad. 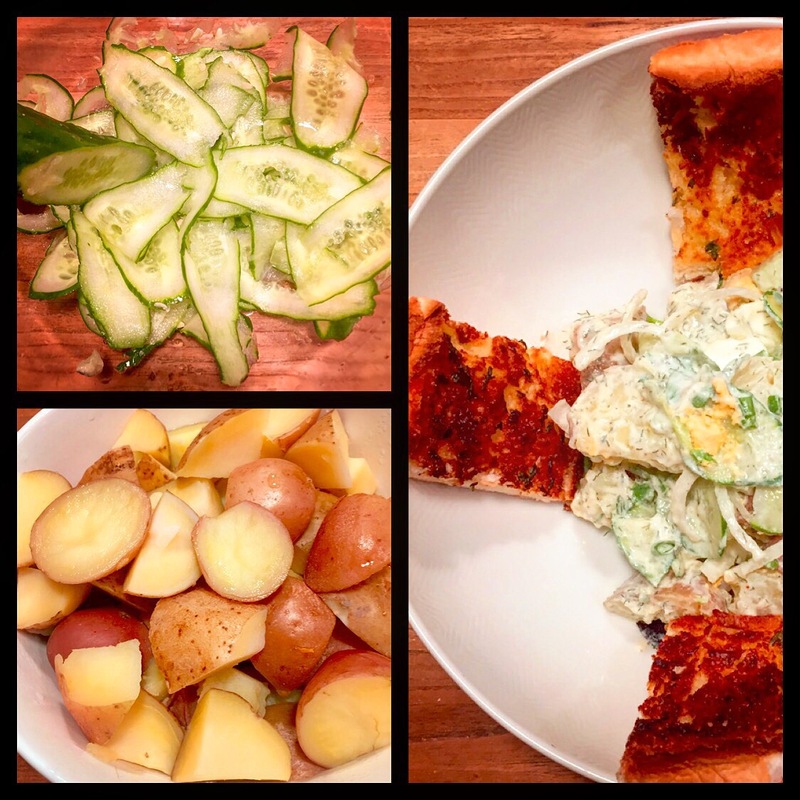 My husband is a big fan of potatoes salad, because of where he is from, Germany! And I know he loves this salad, as always remind him of his mother, that’s how she used to do potatoes salad. First of all, we have to cook the potatoes. There are few ways to do it. You can chopped them in cubes first, then boil them in water or steam them, until they are cooked. You can also boil or steam the entire pototes and roughly cut them into cubes after they are cooked. Make sure you season them with some salt, and then let them cool down or even chill them in the fridge. Depends on how would you like to eat your potatoes, if you would like them a bit warm, no need to chill them too much. To prepare the rest of the ingredients, get a big salad bowl ready, and place everything inside. Thinly sliced cucumber, thinly sliced onion, diced celery and two hard boiled eggs cut in cubes. Mix all ingredients well, together with the potatoes as well. For the dressing, mix Greek yogurt, mustard, salt, garlic powder, half lemon juice, fresh finely chopped dill or dry one, finely chopped spring onion and finely chopped parsley well, then pour the dressing into the the salad. Mix the dressing with the salad and serve it with garlic bread. This weekend is definitely a very health conscious weekend. I always want to try to make this enzyme fruit juice, but I heard that is a tough job to make, but my friend is willing to teach us finally. Friday night, we went out for a drink and this friend was giving us a lecture on how to make it and which area we need to watch out. She is not an expert, but she was making this for few times, when her husband was fighting for cancer. I am amazed by what this drink can do with our body, so I really want to try. I don’t mind to buy, but seems like it’s hard to buy and the one you buy is not really guarantee that is truely authentic. So, why not trying to learn and make my own one! It’s funny, a friend also brought another friend with her, she is a nutritionist and she is running her own business with super food. Of course the night turned into a very health conscious night, and all we talked about was healthy diet. 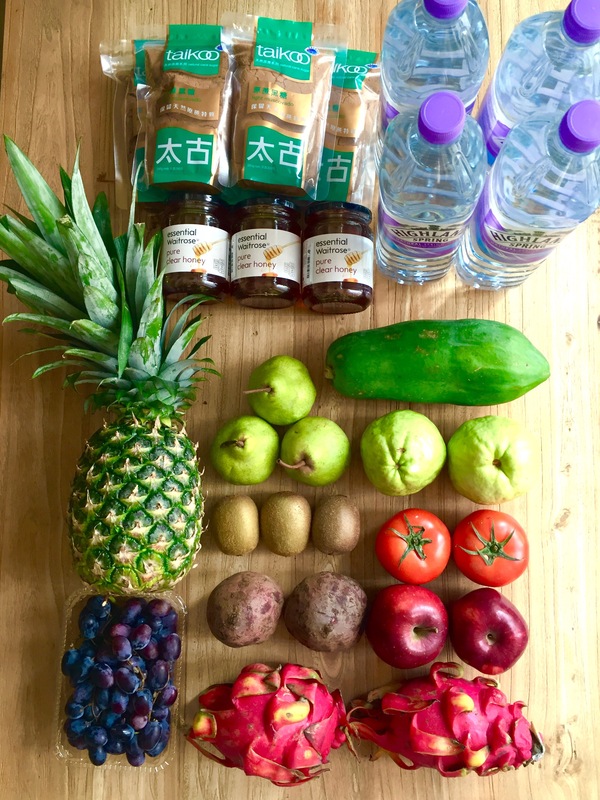 On Saturday, I tried to go around and get all 10 kinds of fruit, other ingredients and the utensils to see if I can make the enzyme on Sunday. To get all the fruits could be difficult, so let’s start searching and see. 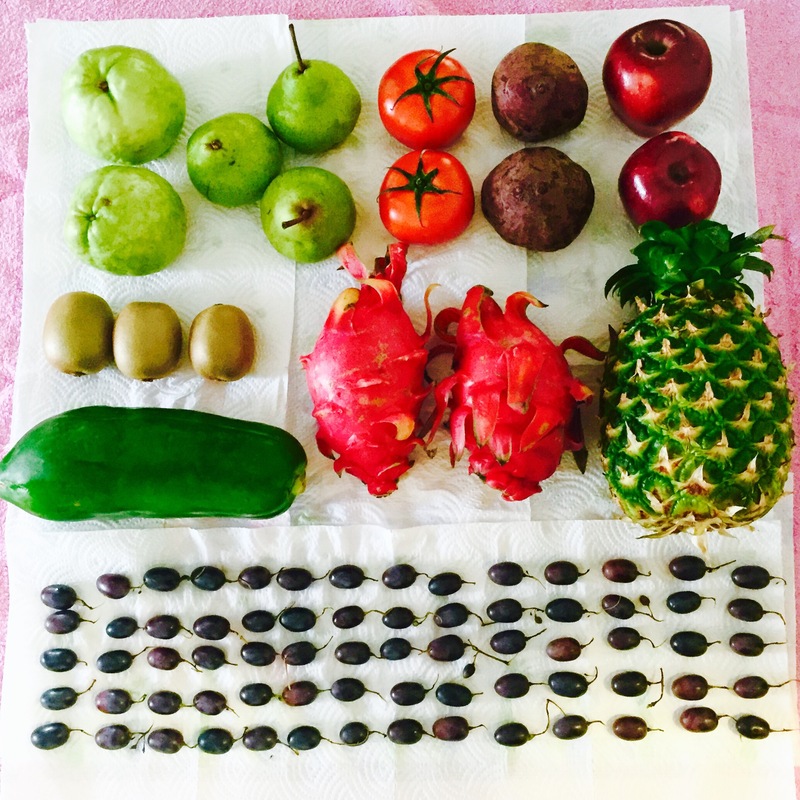 Pineapple x 1, Green Papaya x 1, Dragon friut (red one is better) x 2, Guava x 2, Red apple x 2, Pear x 2, Red tomato x 2, beetroot x 2, Kiwi x 3, dark grapes must be with seed (all seedless grapes are genetic modified) x 60 pcs. Pure honey x 1 kg, dark cane sugar x 1.5 kg, good water (like spring water or filtered water) around 5 litre. New chopping board (either wood or plastic), ceramic knief, few plastic buckles for fruits washing, long wooden spoon for stiring, big glass jar 14 litre with plastic buckle and towel, cling flim, thick elastic bands x 6, new scrub-sponge, fruit scrubber, plastic funnel and plastic strainer. For fruits, better to choose the unripe ones, which is better for making enzyme. The greener and the harder, the better! Of course, anything organic is also good, and I would not choose anything that are from China, try to look for better quality. For kitchen utensils, should not use anything in stainless steel or metal, as try to avoid any kind of chemical reaction. I was trying hard to get everything around home, but it is hard to get grapes with seeds, as all I can found are all seedless! For beetroot, it’s impossible to get it here in Happy Valley as well, so I decided to make a trip to Causeway Bay, I think I can get those missing ingredients in Citysuper! Before heading to Citysuper!, I tried to take a look at the wet market, and I bought the green papaya there. But all the grapes I asked for are without seeds. 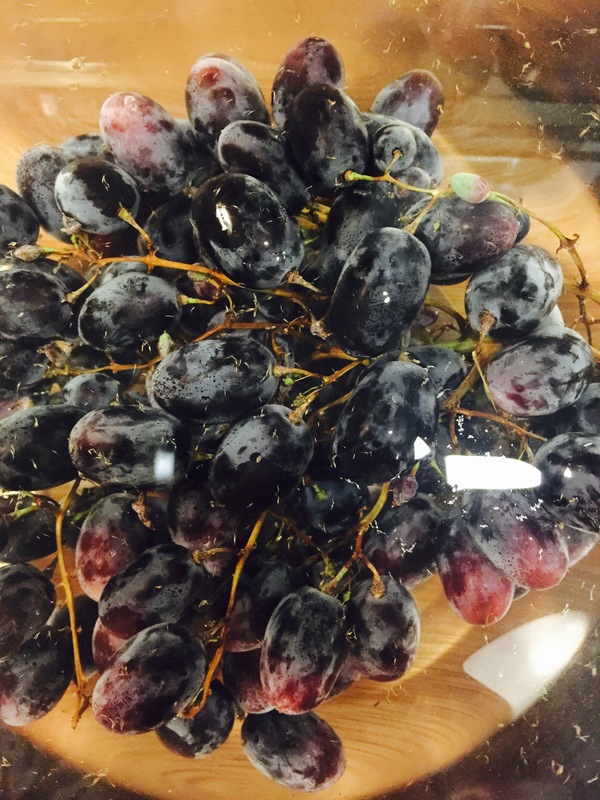 Found some grapes in Citysuper!, but not sure if they are with seeds or not, so I decided to eat one and find out. Grab one pack, hide somewhere and try one out… Yeah! with seeds!!!! It’s so difficult to find grapes with seeds nowadays! I also found beetroot there! I am so happy I can finished my shopping, but overall took me 3 to 4 hours to get everything. So today is Sunday, I will be working on my enzyme fruit juice after getting all ingredients that I need! Let’s start the day healthily, have this super green powder that my friend gave me on Friday night, should help to alkalise and detox my body! She is having her brand and this super food diet by Super Food Lab seems very powerful! I am thinking to get this super green and super red powder to have this everyday. Let’s start making the enzyme, to get all the fruit washed is my first task! Before that, I have to get all the utensils washed and rinsed with hot filtered water. I have two to three containers with filtered water filled, and I’m ready for washing all fruits. I also have to make sure I washed my hands with hot filtered water, I hope I get all procedure right and not screwing up the juice! All the fruits need to be brushed and scrubbed to clean, and get rid of all kinds of chemical. Make sure to wash the fruit with good water, not just the tap water. When you are done with washing, place them on kitchen towel and let them dry. The toughest one is to clean the 60 grapes, either cut the stem with ceramic scissors or pick by hand, but you must keep that little piece of stem on, as you don’t want any water get inside of the grape. You can also use warm water to wash the grapes, as that should help on getting rid of the chemical. When you are done with all the cleaning and washing, place all the fruits nicely on the kitchen towel and cover them with kitchen towel as well. To speed up the drying process, can switch on the dehumidifier to help. One problem that I am dealing with, it’s one of the guava starts to get ripen at one point, as I could not see that part which is hidden under the packaging. I tried to get another pack, which turned out to be the same for the other two! It is bad, as the fruit is getting all soft and wet, and it will not get dry at all! Luckily one of them is better, so I can just use that one among the three ripen ones. So, it is very important to get the unriped fruits, especially after such cleaning and washing. 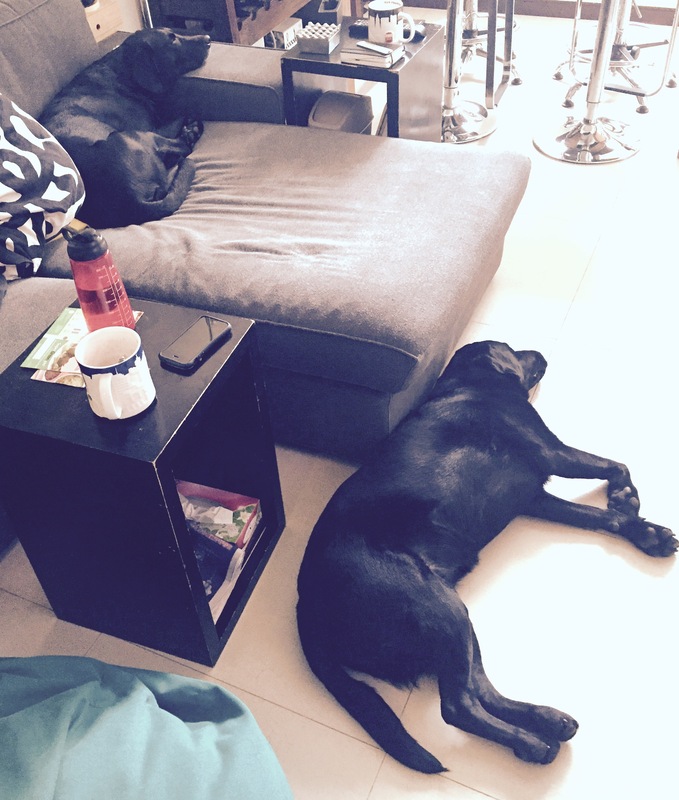 I thought these 2 blackies will be nosy about what I do, but obviously they prefered to chill instead. 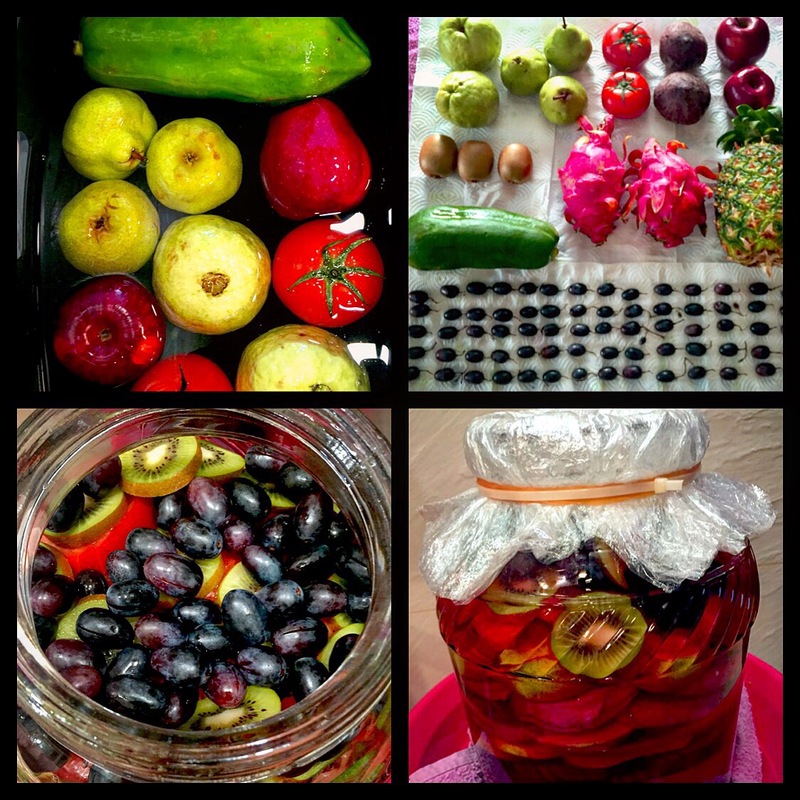 After few hours of drying the fruits, it’s time to cut them and place them into the jar! Of course, please make sure the jar is washed and also rinsed it with hot filtered water. My friend suggested me to place the jar into a bucket and with a towel to protect it, as we need to turn the bottle around everyday afterwards, it’s better to get it well protected. First of all, put the sugar and honey in the jar, then add 1/3 of water and stir them nicely, let the sugar and honey melt and sit nicely in the jar. Better to start chopping the biggest fruit, pineapple, everything should keep the skin, but you can cut off a bit of the skin of the pineapple, especially the spiky parts. Place the pineapple slices at the bottom of the jar. For the rest, it’s up to you about the order. Just cut all the fruits in slices, and place them in the jar layer by layer. For the green papaya, have to remove all the seeds, otherwise the drink will turn bitter. For the grapes, you need to remove the stem and slightly cut open the skin, and keep the seed for the grapes. 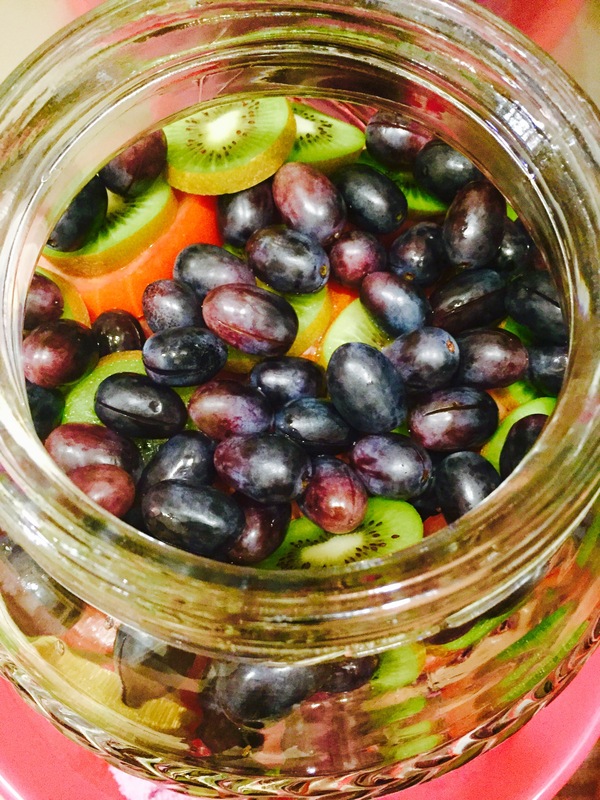 After cutting and putting all the fruits into the jar nicely, fill up the jar with good water to covering all fruits. You are almost done, hang in there! 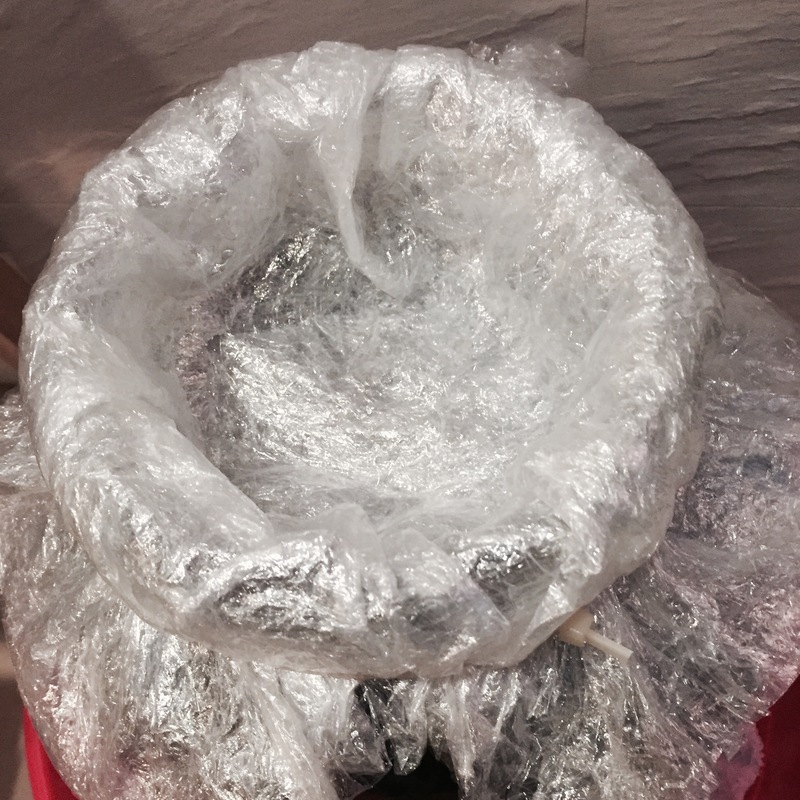 The last step is the closing, get the cling film and get the size that can cover the mouth of the jar, put around 16 layers and place them on the mouth of the jar. Leave enough space for the fermentation later on, then close it by putting 5 to 6 elastic bands at the mouth. I also use tape and plastic straps to add on top and make sure it is tight enough. After 3 hours of washing and 2 hours of cutting, finally done! Let’s see if my first attempt going to be successful… I will update this on my blog everyday. After the third day,the enzyme fruit juice was already popping up! This is a very good sign, as the fermentation must be in progress! Each day, I have to turn it 30 rounds, in order to let the bubbling works. 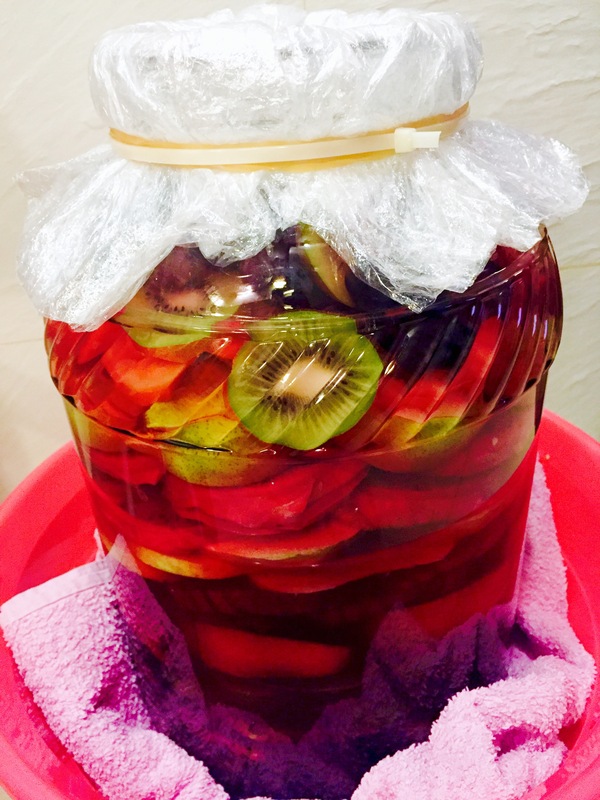 As the weather is kind of hot here in Hong Kong, the fermentation process could be faster. Hope this could be done in one more week! I was told by my friend, it only takes around 5 weeks in Summer time to get this enzyme fruit juice done. It is still around 28C to 32C here in Hong Kong from August to October, so we expected that will be done in 4 to 5 weeks. I don’t why it takes so long for my jar, it just keep bubbling, meaning still working on the fermentation, so we have to wait until the day there is no more bubbling go on inside the jar. After 10 weeks, finally the bubbling stopped! I just can’t wait to open the bottle and see the result of my first jar of enzyme fruit juice. I’ve prepared 10 empty red wine bottles for the storage of the juice, at the same time, we need to also get a sieve, a funnel and a ladle ready. 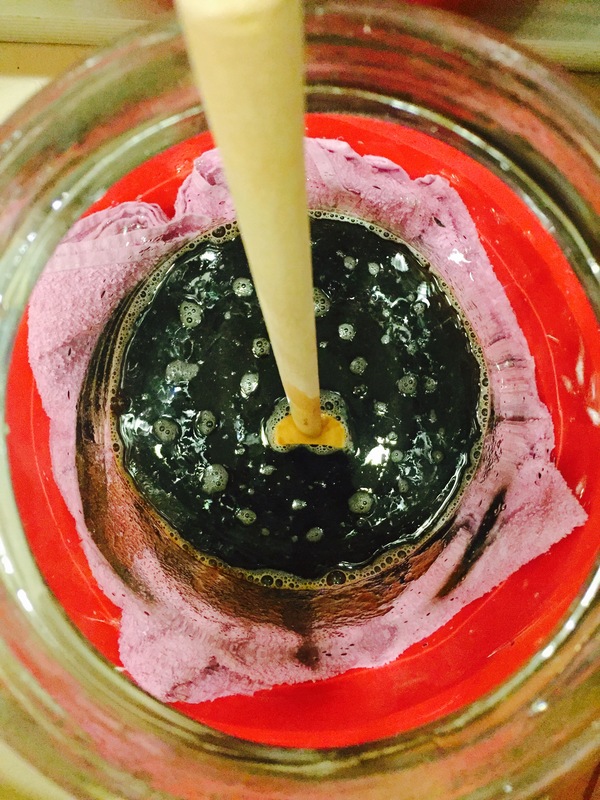 Avoid to use metal utensil, and stay with plastic or silicone, as enzyme can catalyse a reaction by the use of metals. In order to have the juice evenly distributed, we have to pour the juice in all bottles one by one. Therefore, we should not finish one full bottle then go for the next one, we have do it by rounds in sequence from bottle number 1 to 10. You really have to empty your fridge in order to get enough space for the storage of all these bottles. Do not store them horizontal like how we do with bottle of wine or water, as they might be still active and have a chance to spill. Put them vertically inside the fridge and do not close the cap tightly, leave some space in case it has to breath. Try to finish them in 1.5 months by drinking around 100ml per day. Heard that this formula of enzyme juice can really cure cancer, it’s not that I am having one right now, but it is always good to detox and remove radiation from our body. As most of us keep absorbing a lot of radiation everyday, from computer, mobile phone, TV, microwave, and etc. 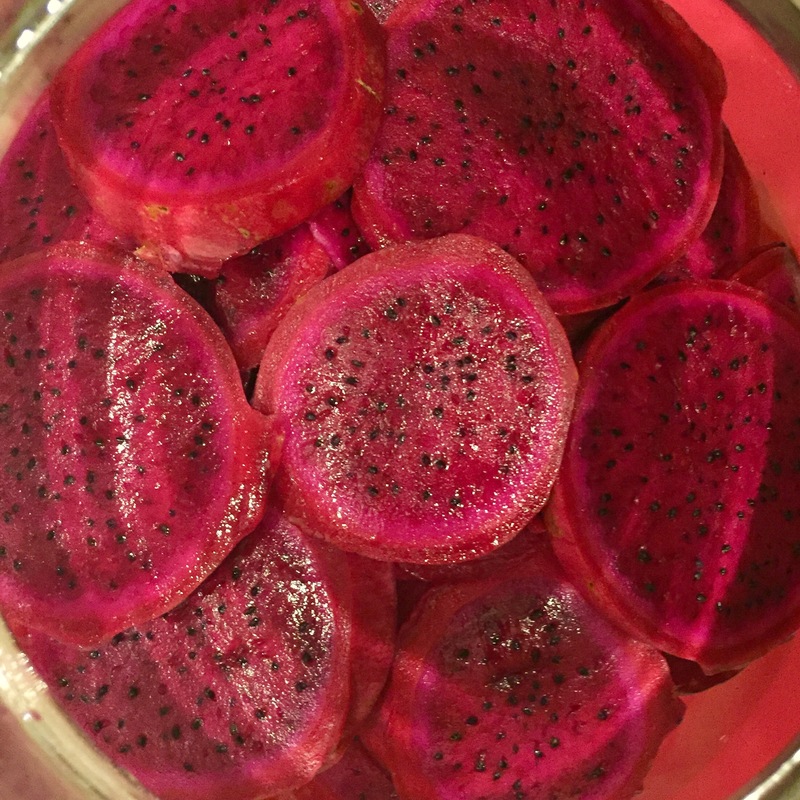 The next day, I started with my second jar of enzyme fruit juice! To reuse some of the fermented fruits into the new jar should help to speed up the fermentation, hope the second jar could be done quicker. Let’s keep it rolling and running! After 10 weeks, this is finally done!!! It takes longer than I thought. The Summer time here in Hong Kong is so hot and humid! I used to drink hot or warm water, but that becomes a bit too hard in Summer time. Sometimes it’s just so refreshing to have a glass of ice water! But for my husband, he always prefer a touch of taste, we used to have some Coke, packs of ice tea or juice inside the fringe. Of course, it is not that healthy to drink those all the time, too much sugar and some sort of unknown chemicals. Last Sunday, while I was preparing the dinner, my husband suddenly jump inside the kitchen and need to make this drink, like right now. He said he just watched Jaime Olivier doing that on TV, orange peel with all the juice in, then lemon peel with all the juice in as well, and one tea spoon of turmeric powder, that’s it! We tried but maybe a bit too much of turmeric, so we made another one with less turmeric, just a few shake, yeah and it tastes fantastic and refreshing! So, from now on we decided to drink this and stopped buying any soda. Turmeric for sure is doing something good to our body, as everyone starting to realise how good and powerful turmeric is, together with orange and lemon which contain a lot of vitamins, it is not wrong to have this as a regular drink instead of Coca Cola. The other day, I was helping to host this event in office, as I am one of the committee of the Green Team in our company. Instead of serving soda, I suggested to have drinks with different kind of fruits, which is going to fit the theme better. Of course one of the key highlight was this drink, but I’ve also created few others in order to provide some varieties. The second one I’ve made was with cucumber slices, lemon wedges and juice with turmeric powder. The third one simply with only lemon and orange slices. 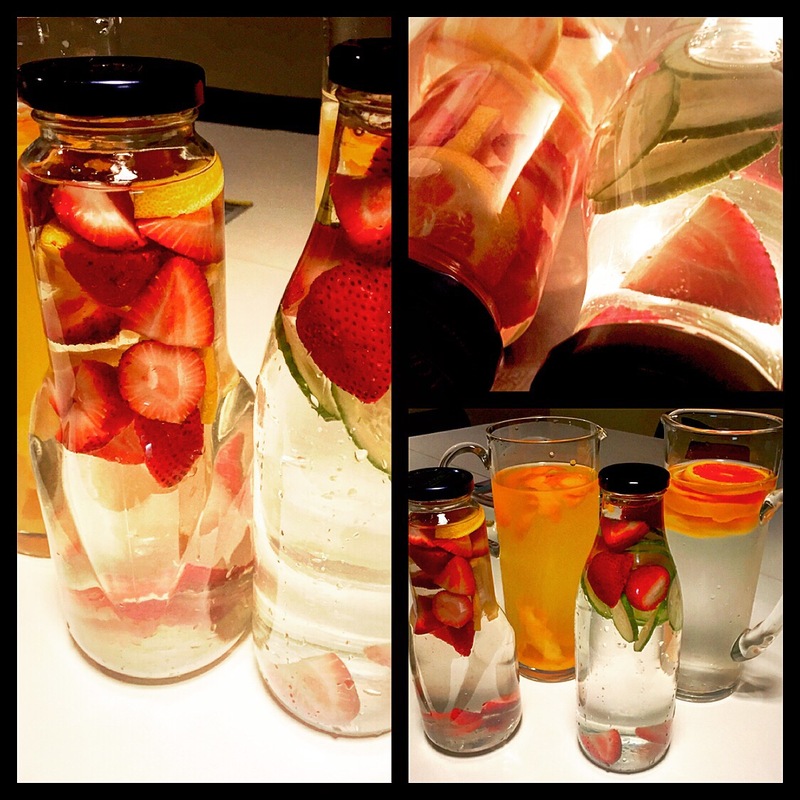 The forth one with strawberries and cucumber slices, and the last jug with strawberries and lemon slices. Everyone were so happy to try them out, some of them were even trying every single one to see how different the taste is, just like a wine tasting. Few of them came to me and would like to know how to make this highlighted drink, and they said for sure they are going to try this out at home! I feel great to share this idea around and now we are having this drink everyday instead of drinking soda, which for sure I believe it’s much more healthy. Well, at least I feel much more refreshing!